If you find photo ops everywhere you look, you are not alone. Garden of the Gods is the most instagramed spot in the Shawnee National Forest. Nestled in the forest, about 30 minutes north is where you’ll find Boars’ Nest Bed & Breakfast, a great base for visiting the area. It’s easy to see why Garden of the Gods is such a sought-out natural site in Illinois. 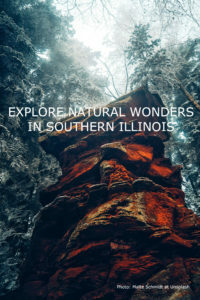 Located along the Ohio River National Scenic Byway in southern Illinois, it features extraordinary sandstone rock formations defined by names such as Devil’s Smokestack and Came Rock. The natural structures are thought to be nearly 320 million years old, and reside in an area that was once covered by a giant inland sea. The massive rocks, more than 20,000 feet thick, have been shaped by natural forces of wind, rain, freezing and thawing, creating the magnificent shapes we see today. To fully appreciate the site, park the care and take time to walk along the Observation Trail. This ¼-mile path features interpretive signs along the way that relate the geological history of the sandstone rocks and provides lovely views of the surrounding Garden of the Gods Wilderness area, which covers more than 3,300 acres. Though the trail is short and takes just about one hour, it does have some steep steps and grades, and has benches along the way where you can sit and rest. Rocky streams, sheer cliffs, pine and hardwood forests—you’ll find all of these en route. In spring wildflowers are plentiful and streams are rushing. Autumn brings stunning colors. Open daily, 6:00 a.m. – 10:00 p.m. Guests at Boars’ Nest Bed and Breakfast will enjoy a peaceful retreat with woodland views. Each of the five cozy cabins feature a queen bed, private bath, full kitchenette; and share a wrap-around deck with an eight-person hot tub. Boars’ Nest Bed and Breakfast is a member of the Illinois Bed and Breakfast Association … a unique lodging experience! 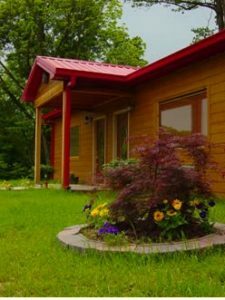 This entry was posted in Hiking, History, Illinois Bed and Breakfasts, Outdoor activities, Touring Illinois and tagged Cabins, History, Illinois Bed & Breakfasts, Illinois Travel, outdoor activities, Shawnee Hills National Forest by admin. Bookmark the permalink.